preSAGE member Prasanta Ghosh, a Professor in SU’s Electrical Engineering and Computer Science department, is coordinating a meeting for professionals in the energy sector titled “Smart Grid Workshop: State of Technologies & Future Research Directions,” assisted by Shalini Suryanarayana, the department’s Smart Grid Program Director. 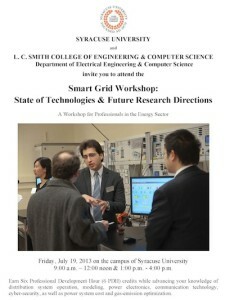 The workshop takes place on July 19, 2013 on SU’s campus. This workshop will introduce intertwined topic areas to show the complex nature of the smart grid, including power distribution systems with distributed sources, optimization, control, communication, cybersecurity processes in power systems, and how advanced technology will positively impact energy suppliers, manufacturers, consumers, and society. For more information, contact Shalini Suryanarayana.